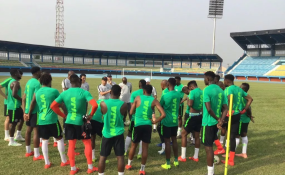 Abuja - It was a full house on Tuesday as the Super Eagles began their first training session ahead of their 2019 Africa Cup of Nations (AFCON) final qualifying match against Seychelles. All the 23 invited players have now reported to camp and took part in the team's first training session at the Stephen Keshi Stadium, Asaba. NAN also reports that Odion Ighalo, Alex Iwobi and Semi Ajayi were among the first arrivals in the Super Eagles' camp in Asaba on Monday. Others in camp were Goalkeepers Francis Uzoho, Ikechukwu Ezenwa and Daniel Akpeyi as well as home -based professionals Ikouwem Utin, Ndifreke Effiong and Valentine Ozornwafor.